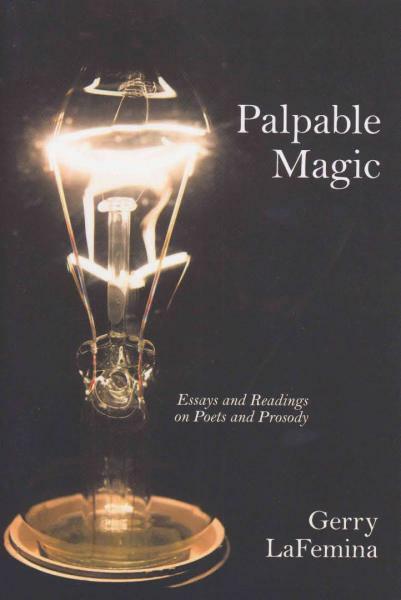 Stephen F. Austin University Press published Gerry LaFemina's book of essays on poets and prosody, Palpable Magic, in 2016. The book, broken into three sections, focuses on the prose poem, reviews and discussions of poetry, and a variety of aspects of poetic craft. Poet and critic T.R. Hummer says about the book, "LaFemina is interested in boundaries, in the edge where on thing turns (via a palpable magic, an alchemy) into something else.... Governed by a desire to understand how a boundary can be not a limit but a point of metamorphosis, LaFemina examines, compellingly, the wellsprings of the work of various poets (some famous, some not) and ultimately, the magic of his own. Some of Gerry's earliest publications were book of reviews, and later, he began working with poet Dennis Hinrichsen on Review Revue, a quarterly tabloid of poetry reviews, craft essays and interviews with poets. He's published numerous essays and reviews about poetry and poetic craft, and has appeared at various conferences and instituions talking about poets, poetry, and translation, including as Fulbright expert in Brazil, discussing the work of Elizabeth Bishop, the MLA Conference, the AWP annual conference, and the annual FLAC Other Words Conference. For several years he covered poetry and the business of publishing for Highbrow Magazine, and more recentlysays on poetic craft, and he now writes regularly for Coal Hill Review.